Surrounded by mountains, Lake Lugano is the centerpiece of Switzerland's Ticino region, the southern canton where Italian is the official language. You'll notice more than a distinct Italian accent in the cuisine, architecture, attitudes, and more laid-back lifestyle than you'll find elsewhere in Switzerland. Lugano is the largest and most important town in Ticino; its beauty and gorgeous setting make it one of Switzerland's most popular holiday resorts. Lugano is not the region's only lake. The northern end of Lake Maggiore extends from Italy into the Swiss Ticino, and at its top lies Locarno, its villas and gardens rising above the lake. 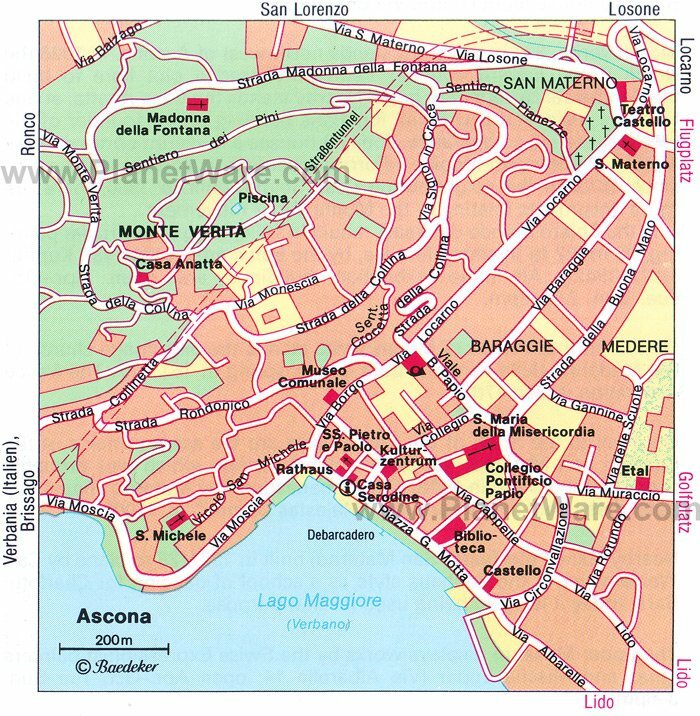 Locarno and nearby Ascona are connected to Italian lake towns by regular boat services and by a shore-hugging road. Beautiful Lake Lugano is Ticino's star attraction, and tourists can enjoy it in a number of ways: tour on one of the white steamers (excursion boats have been plying the lake since 1848), rent a boat to sail on your own, or choose any of the dozens of mountain or shore viewpoints and gaze at it. The steep wooded mountainsides that form much of its vertiginous shore give a wild, untouched appearance to all but a few valleys where rivers flow in from the mountains. The mountains not only give Lake Lugano a stunning backdrop from nearly every angle, but they provide some of Europe's finest viewpoints to admire it from. Some favorite spots around the lake are best accessed by boat, a fine way to reach the traditional grottos, or little informal restaurants along its shore. One of the other popular things to do here is combine a boat cruise with walking, taking a boat to Gandria and walking back to Lugano along the Sentiero dell'Olivo. Spacious green parks border the lake at the northern end of Lugano, shaded by trees and brightened by flower gardens. Surrounded by the venerable trees and subtropical plants of the Parco Municipale is the Palazzo dei Congressi convention center and the 1843 Villa Ciani, which houses historical and art collections. The long lakeside promenade follows the shore for the entire length of Lugano to the southernmost boat landing at Paradiso. In places, it widens to park dimensions with subtropical gardens and modern sculptures lining the walkway. Facing it are distinguished old buildings, including the 18th-century Palazzo Riva. From every point on the promenade are postcard views of the lake, framed by the surrounding mountains. Although its altitude is only 912 meters, Monte San Salvatore's summit offers one of the most beautiful and panoramic vistas in the entire Alps. Below you can see Lake Lugano as it weaves its circuitous way among the steep, wooded slopes that enclose it. The red tile roofs of Lugano scatter across the town's hillsides, and other villages cluster around the shore. Turn your back on the lake and town to find a sea of alpine peaks stretching to the horizon, crowned by Monta Rosa and the Valais Alps. You can climb Monte San Salvatore, but most tourists prefer the 10-minute ride on the red funicular from Lugano's lakeshore station of Paradiso. At the upper station, you'll find a restaurant, viewing terrace, and walking trails leading down to Carona, Melide, Morcote, and Figino. 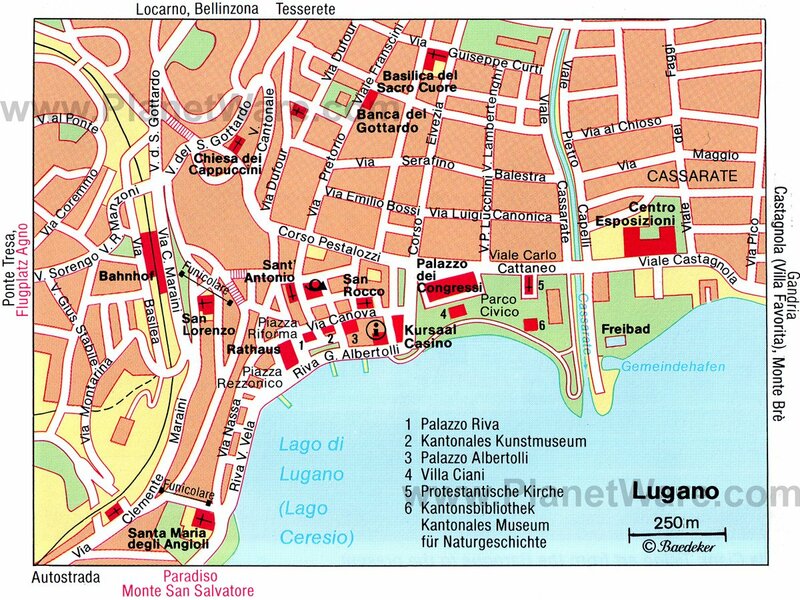 You can return to Lugano from any of these by rail, postal bus, or boat. The church of a former convent, Santa Maria degli Angioli faces the lake at the end of Lugano's most fashionable shopping street. Inside is one of Ticino's most impressive art treasures, a full wall covered by a single fresco, the early 16th-century masterpiece of Bernardino Luini depicting the Passion and Crucifixion. The fresco measures 30 meters by 12 meters, and is filled with larger-than-life figures modeled after patrons and family members. On a side wall is Luino's Last Supper, moved here from the monastery that stood next door. The 220-meter Verzasca Dam holds the distinction of being one of the highest in Europe, but to the world it's known for James Bond's death-defying jump in the opening scene of GoldenEye. But the dam is a modern intrusion that has not spoiled one of the most beautiful of the Ticino's many river valleys. As the river tumbles down its rocky course, its notoriously emerald green waters form waterfalls and swimming holes surrounded by ledges for sunbathing. It passes beneath stone bridges and through ancient alpine villages. The best known of both - and with a picturesque waterfall, too - is Lavertezzo. Here, the Ponte dei Salti stone-arched bridge crosses the river, and from the village church, you can follow the Revöira walking trail along a well-marked route used over the centuries by villagers bringing their flocks and their families to the high mountain pastures for the summer. Along the way, you'll see remains of ancient water systems and reservoirs carved into the stones. Learn about these semi-annual migrations, called transhumance, at the Museum of the Verzasca Valley in Sonogno,a quiet stone village at the end of the valley. A bus route from Lugano follows close to the river, with frequent stops, so you can get off and walk along the trails from village to village without doubling back. Monte Brè, whose distinctive cone rises at the north end of Lugano, can be reached by a narrow road, walking trails, or by a funicular to its 933-meter-high summit. Along with a scenic terrace, you'll find two restaurants. On the eastern slope is the village of Brè, a tiny settlement of traditional Ticino-style houses that's a favorite of artists. You can follow an artists' trail, and the Wilhelm Schmidt Museum displays works by the Swiss painter. Monte Brè is said to be Switzerland's sunniest spot, and it's also one of the most scenic, with views as far as the Valais Alps. Bellinzona's three castles are listed as UNESCO World Heritage sites and are well worth exploring. 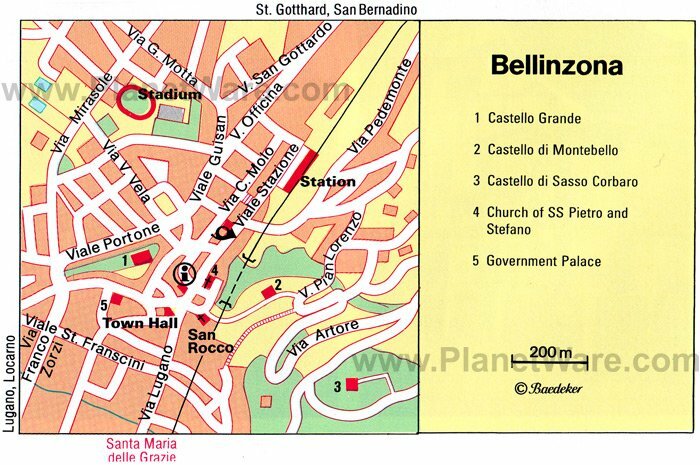 Bellinzona was an important stronghold as the meeting point of three important north-south routes over the alpine passes of St. Gotthard, San Bernardino, and Lucomagno. All three could, in the past, be closed by a barrier across the road at Bellinzona, giving it a strategic position for centuries. The three castles that still dominate the town are among the most important examples of medieval defensive architecture in the Alps. These, along with a double circuit of walls, were built or strengthened by Milanese rulers in the second half of the 15th century. The oldest, Castelgrande, was constructed above the town center over a Roman castle. Castello di Montebello stretches along a hillside on the east side of Bellinzona and is the most interesting example of the art of fortification, built from the 13th to 15th centuries. The square-shaped Castello di Sasso Corbaro was built in less than six months in 1479 to reinforce the defenses of the valley after a battle. Today, the castles house various museums covering history, art, archaeology, and local costumes. The old town is worth exploring as well, for its beautiful Italian-style town houses and the magnificent wall paintings by 16th-century Lombard artists in the former Franciscan church Sta Maria delle Grazie. Lugano's old town rises abruptly from the three squares that surround its Palazzo Civico (town hall), in a street that is a series of stairways and terraces. Beside it, a funicular climbs to the rail station high above. A wide terrace opens out in front of the church of San Lorenzo, Lugano's cathedral. Originally Romanesque, it was enlarged in the 13th and 14th centuries and altered extensively in the 17th and 18th centuries. But it retains the beautiful medieval frescoes in its otherwise mainly Baroque interior. You can descend through the winding streets of the old town or follow stairways that connect between parallel streets to make your way more directly to the lakefront. One of Europe's most scenic train rides leaves from Locarno, following lofty tracks perched high above the Melezza River and its tributaries. Over millennia, the snow melting from the Alps has caused each of these rivers to carve a deep valley - reputedly 100 of them, hence the name centovalli. Charming vintage rail cars go slowly enough to allow views down into these steep, wooded ravines as the train crosses 83 bridges on its way to Domodossola, the Italian town at the foot of the Simplon Pass. A promenade traces the shore through the terraced Parco degli Olivi at the far northern end of Lugano's promenade, turning into a wide walking path that hugs the slope of Monte Brè as it parallels the shore. View after view unfolds as the path passes through the narrow streets of lakeside villages and among the gardens between them, shaded by cypresses, pines, and olive trees. Panels along the way explain the history and cultivation of olive trees. This Sentiero dell'Olivo, Olive Path, leads to the picturesque terraced village of Gandria. Among its steep, narrow lanes and arcaded alleys, you'll find the Church of Saint Vigilio, built in 1463, but with a Baroque facade completed only in the late 1800s. The lake is quite narrow here, and directly opposite (you can take a boat across) is a grotto restaurant and the Swiss Customs Museum with exhibits about smuggling and illegal trade. A funicular from Via Ramogna, just below Locarno's train station and toward Piazza Grande, leads up to the wooded crag from which the pilgrimage church of Madonna del Sasso overlooks the lake. You can also climb to the church and its Capuchin friary on foot, by a path with Stations of the Cross, in 30 to 45 minutes. Founded in 1480, the church was rebuilt in 1616 and redecorated ornately in the 19th century. The church's most outstanding artworks are Flight into Egypt, a major work by Bramantino in 1536, and Entombment by A. Ciseri from about 1865. The first is to the right of the entrance and the Ciseri is in the second side chapel. In the monastery museum is a collection of ecclesiastical art and manuscripts. Views over Lake Maggiore from the terrace are superb. A unique open-air museum exploring traditional rural life spreads throughout the remote Muggio Valley hidden between Lakes Lugano and Como. Along with a large museum building packed with fascinating exhibits and artifacts, the Museo Etnografico Valle di Muggio encompasses a water-powered polenta mill, cheesemakers, an open-air village laundry, a chestnut drying shed, and other sights. Begin in the village of Cabbio, where a large relief map shows the valley and locates attractions that are part of the museum, which stretches for miles and scatters throughout several towns. Mulino di Bruzella, a stone mill powered by a water wheel, sits deep in a valley and is reached by a wide path through the forest - about a 30-minute walk from the road. The mill grinds rare, local red corn, a heritage crop revived through back-breeding and grown only in this region. You can watch the mill as it grinds, and buy the polenta here. At farms throughout the valley, you can also buy local honey, chestnuts, and cheeses made from the milk of goats that graze in mountain pastures. This way of life, with one foot in the 2st century and one a century back, is a sharp contrast to the smart, chic lake resort towns just a few minutes away. In Lake Maggiore, just off the picturesque village of Ronco, are the two small islands of Brissago. On the larger one is a botanic garden of Mediterranean flora, displaying about 1,500 species of exotic plants arranged by their geographical origins. Plants native to subtropical regions thrive outdoors in this latitude because of the warming effect of the lake. The gardens were begun in 1885 by Baroness Antonietta Saint Leger, who not only collected the plants but cataloged them in detail. Her work was continued in the 1920s by a German businessman, who built the villa you see here today. Along with exotic plants native to Asia, South Africa, and the Americas, the extensive gardens include a section devoted to local heritage vegetables, including the rare Ticino red polenta corn. You can get to the island by boat from Porto Ronco, just north of the Italian border. South of Locarno on Lake Maggiore, Ascona has developed from a little fishing village into one of Switzerland's most popular holiday resorts, with long hours of sunshine and a mild winter. Unfortunately, its popularity brought with it extensive modern development that has largely swallowed up the old village, but its harbor area is still an attractive blend of Italian and Swiss architecture with a few old buildings. The 17th-century Casa Serodine, now known as Casa Borrani, has a sumptuous facade of Baroque stucco with a frieze of mythical creatures and biblical scenes, and the Collegio Pontificio Papio from 1584 has one of the finest Renaissance courtyards in Switzerland, with two-story loggias. In the Dominican church of Santa Maria della Misericordia, built from 1399 to 1442, is a cycle of late Gothic frescoes. An art colony here attracted artists including Paul Klee, whose work you can see in the Museo Comunale d'Arte Moderna. Luxury Hotels: Facing the lake and promenade and a five-minute walk from the fashionable shopping street, Hotel Splendide Royal has lake views from its elegantly decorated rooms, and the attention to detail expected from a Leading Hotels of the World member. Grand Hotel Villa Castagnola is in a beautiful lakeside neighborhood, a short walk from Parco Civico, with a pool, tennis courts, and lake views. Lugano Dante Center Swiss Quality Hotel overlooks the town and lake from the steep, pedestrianized streets near the cathedral, close to shops and restaurants. Mid-Range Hotels: At the rail station, with good views over the town and lake, Continental Parkhotel has free parking, a pool, palm gardens, and rooms with balconies. On the promenade at the corner of pedestrianized Via Nassa, family-run Hotel International au Lac is filled with old world charm. At Paradiso boat landing and adjacent to the Monte San Salvatore funicular, Novotel Lugano Paradiso is a modern hotel with a fitness center and pool. Budget Hotels: On the hill near the rail station and a 10-minute walk from the center, Albergo Stella has a pool and rooms with balconies, but no elevator. With balconied rooms and close to several restaurants, Hotel Atlantico is near the Monte Bre funicular and Cassarate lake steamer stop. Ibis Budget Lugano Paradiso is at the Paradiso boat landing, adjacent to Monte San Salvatore funicular.